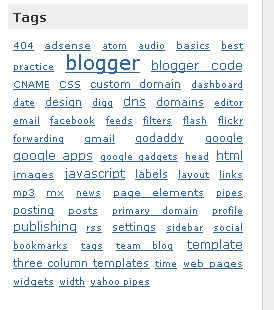 I think you might have seen tag clouds in blogs running WordPress blogging software. Tag cloud is a pretty cool widget that collects all post tags in a particular blog, and then projects out the most popular ones in between others. In Blogger blogs, we can rename it to label cloud as here we use to label each post. Label cloud widgets are filled up with your keywords. Since they are displayed in the sidebar the reader might click on a keyword of their choice and get re-directed to corresponding pages. So putting a label cloud would improve your blog traffic. Interested? Here is a simple hack to enable a label cloud of tag cloud in Blogger. To begin with, you will have to add a label widget anywhere into your blogger layout as shown below. Now click on add page element to add a label. If you’ve already added a label in required location, then here follows the next step. Remember to download and backup your Blogger template before doing any modification. Press Ctrl+F, search for term <b:widget and press the arrow key on right until you can see the code line <b:widget id=’Label1′ locked=’false’ title=’Tags’ type=’Label’>. Also, scroll down and find out </b:widget>. Now delete everything in between including the above lines of code. Download Blogger label cloud code here, copy and paste it in place of the deleted label widget and save. Edit the following sections to increase or decrease maximum and minimum font size from default. Refresh your home page. Now you would be able to see a simple text based label cloud In your Blogger blog. Now, search for the following line. Download the animated label cloud code here and paste the lines just below the above given section, then save the changes. Inside the code lines, locate the following terms and change them with custom values of your choice. Change font size of the label cloud to match with your template. Change the font size from 12 to a suitable value. 3. No Flash player required. 4. Better page load time. So what about you? Which one is your favorite Blogger label cloud widget among the two? Share your thoughts in the comment section. How do i add nofollow to the labels ? hi, could you please help me on how to install cloud tag for classic template?thanks!